Humans are strange, thrill-seeking creatures. We crave not just a thrill, but something so terrifying that we think, if only for a moment, that we might not actually survive. For those of us not ready for base jumping in wing suits, roller coasters can fulfill that excitement lust. And the amusement park fixtures may never have existed if not for something decidedly unthrilling (though important! ): coal mining. In the early 19th century, a coal company operator in Pennsylvania named Josiah White decided to allow the locals a ride on the mine's trains after hours. The trip was an intense 9-mile dive down a mountain, and people loved it. Mules carried the cars back up once they reached the bottom. Several years later, White invented roller coaster's first big innovation: the thing that makes that distinctive click while they climb. To help meet increasing coal demand, White expanded his operation by building a 664-foot vertical track climbing up a nearby mountain. The steep slope meant an increased risk that cars could lose their grip and slide backwards. So White added a third rail in the middle along with cars equipped with ratchets that engaged with the middle track to prevent backsliding. Trolley companies jumped into the amusement game at the close of the 19th century, adding small parks at the end of their lines. One notable trolley terminal at Coney Island brought roller coaster culture into the mainstream with rapid-fire coaster innovation. A 600-foot, gravity-powered, switchback railway going an astonishing six (!!!) mph, was such a success that its inventor, La Marcus Thompson, recouped the $1,600 bucks he spent on building the ride in just six weeks. Another inventor turned the typically linear tracks into a loop. Yet another in 1885 kicked his ride off with a powered hoist that yanked cars up to the top of a hill before letting them go. 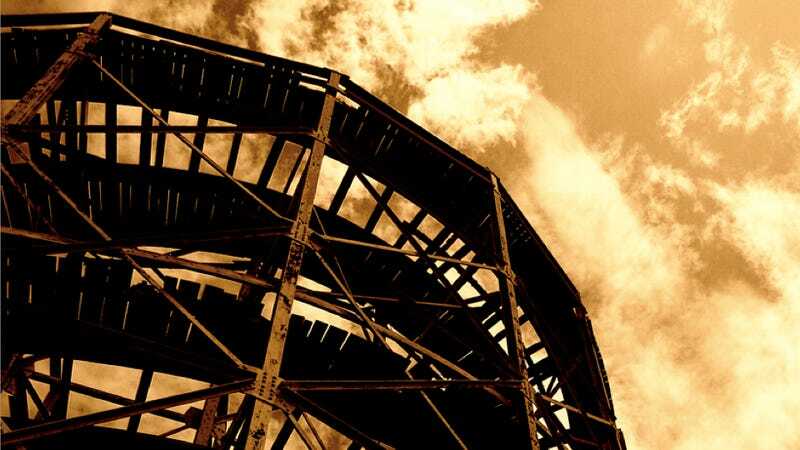 Just 10 years later, Coney Island introduced the vertical loop to the roller coaster design cannon with the Flip-Flap Railway. The 25-foot inversion was physically uncomfortable to say the least, and it only operated for a few years. Then, in 1901, a coaster with a more gentle oval design mitigated the G-forces. Side note: the lap bar had not yet entered the scene. During the upside down parts, G-forces and handles on the side of the cars were the only things holding riders in. Higher speeds, thankfully, brought better safety precautions-something absolutely necessary when whipping around at 150 mph without even a helmet. (Did you know there is a roller coaster in Abu Dhabi that goes 150mph?!) Flying forward at even half that clip will make your body feel like a twisted slinky, thanks to G Forces in three directions. But here's the thing: engineers have gotten really good at fine-tuning these G-forces to your benefit. A 5-G force makes a 100-pound person feel like she weighs 500 pounds. Kent Bachmann, the director of design and engineering for Hersheypark in Pennsylvania, says they stop short of 5Gs, "because some people black out—but we flirt with it." Your body will register 5Gs at anything over 200 milliseconds, but if you hit 5Gs for a fraction of a second less than that, your body wont feel it. That dipping in and out of such intensity is all baked into the design. Alleviating some of that force is important, too, and elements like banked turns take the pressure off. Sudden acceleration, change in direction, and the feeling of weightlessness also add to the thrill. Wooden roller coasters rely in part on that out of control feeling you get while speeding around the track. Older models were decidedly jolty, but more precise construction, thanks to better computer-powered design tools, allow modern "woodies" an experience reminiscent of coasters past, but without the residual head ache. That particular out of control feeling comes from the materials. "Wood grows and shrinks with the weather, and the distance between the rails changes over time," says Evan Souliere, a design engineer at Great Coasters. "With steel, you're in constant contact with the track; with wood, you're not." It may feel like you're going to fly off the track, but the design ensures you won't. Wooden coaster tracks look like an upside down, inward pointing pair of Ls. On the top of the track, there's a strip of steel that the trains ride on. Just inside that, 90 degrees from the road wheel, is a guide track. A smaller set of wheels runs on this surface facing outward, stopping the cars from moving side to side. A third set of wheels runs on the underside of the track, pointing upwards, keeping the train from going airborne. Because there is movement in the wood, not all the wheels touch all the time-which is what makes us want to pee our pants as they lose contact with the seat. Steel coasters can take you higher, faster, and offer more upside down time, but they still rely on sensory trickery. Hersheypark's new $25 million "Skyrush" coaster carries riders over an existing wooden looped ride, taking them what seems like arms reach of other park goers. They've also stripped the 75 mph ride of upper body armor, leaving you free to throw your arms up unencumbered. There's a seat belt and lap bar combo that will keep you safe, but the feeling that perhaps you won't be makes the ride, which opens this summer, that much more terrifying. Who knows, maybe humans would have invented roller coasters even without coal mining. Even in 15th-century Russia, long before the 100 mph-plus, 4G scream machines we have today, folks got their thrills by schlepping wooden toboggans up 70-foot hills to slide down an ice slope at 50-miles-per-hour. The man-made hills were called "flying mountains," and they sound quite terrifying, not to mention very dangerous—but also, of course, tantalizingly fun.